TUGboat, Volume 35 (2014), No. 1. Nicola L. C. Talbot, LaTeX for complete novices. Dickimaw Books, 2012, x+279 pp. Paperback, GB£12.99. ISBN 978-1-909440-00-5. Nicola L. C. Talbot, Using LaTeX to write a PhD thesis. Dickimaw Books, 2013, x+148 pp. Paperback, GB£9.99. ISBN 978-1-909440-02-9. These two books by Nicola Talbot are actually volumes 1 and 2 in her Dickimaw LaTeX Series; however, the other volumes are being revised at the time of writing, so this review deals only with these two. Dickimaw Books is an independent publishing house created and owned by Nicola Talbot herself; besides this LaTeX series it has published crime fiction and children’s books (including a fairy tale based on Vladimir Propp’s structural theory). Both LaTeX books are available as paperbacks (with a discount for TUG and UK-TUG members), or can be downloaded for free from the Dickimaw Books web site (http://www.dickimaw-books.com), licensed under the GNU FDL. The electronic versions provide helpful internal and external hyperlinks. As its title suggests, the first volume is intended for beginners. There are many books for new LaTeX users today. The number of free (as in free speech) ones is smaller: I can recall only Oetiker’s great “The not so short introduction to LaTeXe”, now included in the major TeX distributions as the lshort package. What distinguishes Talbot’s book is its firm grasp of modern TeX customs including the modes of communication between TeX users. 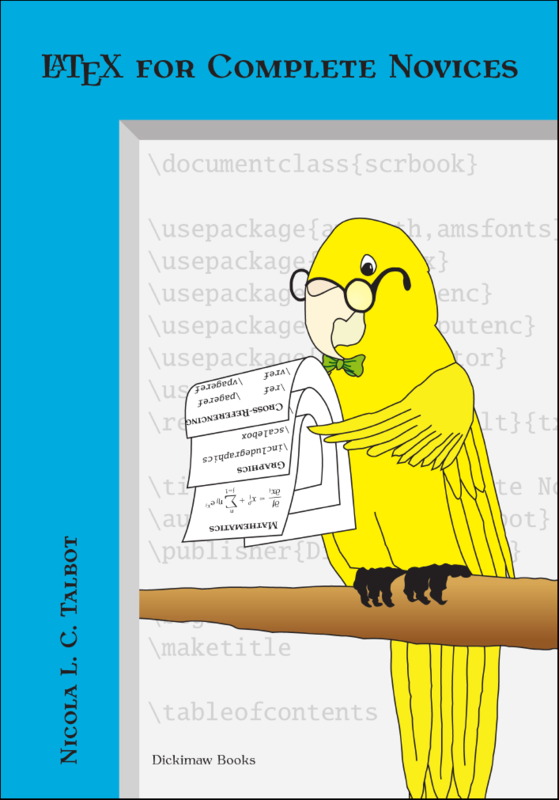 The book sends the reader to the relevant sections of the UK FAQ for detailed information on the topics discussed, it explains how to ask questions on Stack Exchange and LaTeX community forums. Another sign of modernity is that the book effectively drops the venerable DVI output format; the author merely mentions it in a short paragraph basically saying, “people do not do this anymore” and then discusses only the PDF output. I think this is the right decision, at least for “complete novices”. On the other hand, the book includes some topics traditionally considered out of scope for beginners, such as the use of fonts other than Computer Modern. Modern TeX installations have a large number of high quality fonts with very good transparent TeX support, so this topic may now be considered appropriate for novices. On the other hand, the author wisely does not discuss the further possibilities in this area provided by X E TeX or LuaTeX. The tradition of active use of TeX has resulted in the fact that almost any book for beginners teaches how to define and redefine commands and environments; any TeX user is seen as an (at least budding) TeX programmer. Talbot’s book is not an exception: it has two good sections on TeX programming with the proper warning about the danger of redefining macros without understanding them. The author does not try to cover the multitude of TeX-aware editors and integrated environments. Instead she introduces TeXworks as the preferred work environment and latexmk as the compilation wrapper. Again, this seems to be a very good decision: too many choices are good for an experienced user, but can be intimidating for a novice. Another decision is slightly unusual. While most books for beginners start with the standard classes (article, book, report, letter—it seems nobody uses slides, however), this book is based on the KOMA-script bundle. I agree that the base classes are now rather long in the tooth, so it makes sense to teach novices some newer and arguably typographically better stuff. Thus the author’s experiment seems to be a very promising one. On the other hand, unlike base LaTeX, KOMA is not frozen, which may require updates of the book after changes in the package. The book is well written and has many carefully chosen exercises. 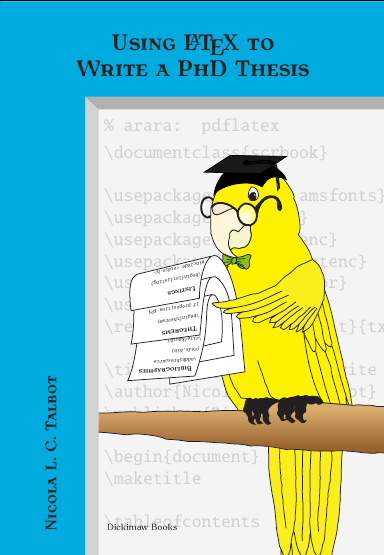 It is a very good candidate for a first LaTeX book. Of course, this does not mean the book has no flaws. I am not comfortable with the fact that the user’s first TeX document appears only on page 32; the previous chapters contain definitions of terms and installation instructions. Unfortunately students today have become used to instant gratification, so some of them may just stop reading much earlier than this if not provided with a hands-on experience. I would suggest starting with the “Hello, world” document and put the definitions and installation instructions later—or in an appendix. Also, independent publishing means the absence of a professional editor, who might question or correct an author’s (rare) mistakes. For example, TeX glue is not called such because in the days of manual typesetting the blocks were glued in place; rather, it is a metaphor invented by DEK. (I doubt it is practical to glue reusable type, and anyway, TeX glue is between the boxes rather than under them.) The author’s advice to substitute displaymath for \[…\] is strange: displaymath is defined by the kernel basically as \[…\]. On the other hand, the advice not to use the ugly eqnarray is right on the point. Mistakes are evidently rare and don’t touch on essential points, so the book can be recommended for studying LaTeX. Many universities still require double-spaced, single-sided documents with wide margins. Double-spacing is by and large looked down on in the world of typesetting, but this requirement for a PhD thesis has nothing to do with æsthetics or readability. In England the purpose of the PhD viva is to defend your work (I gather this is not the case in some other countries, where the viva is more informal, and the decision to pass or fail you has already been made before your viva.). Before your viva, paper copies of your thesis are sent to your examiners. The double spacing and wide margins provide the examiners room to write the comments and criticisms they wish to raise during the viva, as well as any typographical corrections. Whilst they could write these comments on a separate piece of paper, cross-referencing the page in the thesis, it is more efficient for the comments to actually be on the relevant page of the thesis. That way, as they go through the manuscript during your viva, they can easily see the comments, questions or criticisms they wish to raise alongside the corresponding text. If you present them with a single-spaced document with narrow margins, you are effectively telling them that you don’t want them to criticise your work! To tell the truth, I miss the exercises that were an important part of the first volume. On the other hand, one may argue that a stressed graduate student may not find the time to do the exercises. Both books are nicely typeset with Antykwa Toruńska as the main serif font and Libris ADF as the sans serif one. This is again a pleasant diversion from the too-uniform look and feel of many LaTeX books. I am not too happy with the way the footnotes are numbered, with the section number used as a prefix (e.g.4.5). Unlike equations, footnotes are not usually referenced from other parts of the book, so this prefix looks a bit mannered. However, this is just about my only issue with the typesetting. The books have functional margins with the notes and signs; the text is pleasant to read. There are detailed bibliographies and well constructed indices. These books are a good addition to any TeX user’s library; I wonder whether the author would be willing to put them on CTAN and to include them in the TeX distributions. It will be interesting to see the next volumes in the series published. If they are written as well as these two, the world of TeX textbooks and reference books will have more welcome additions.